Our neighbour has employed a new gardener who will not spray. 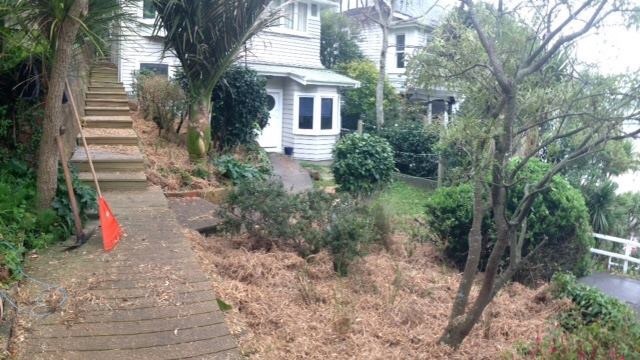 He’s planted the native grasses you can see in the background, beneath her (spring-flowering) kowhai tree. 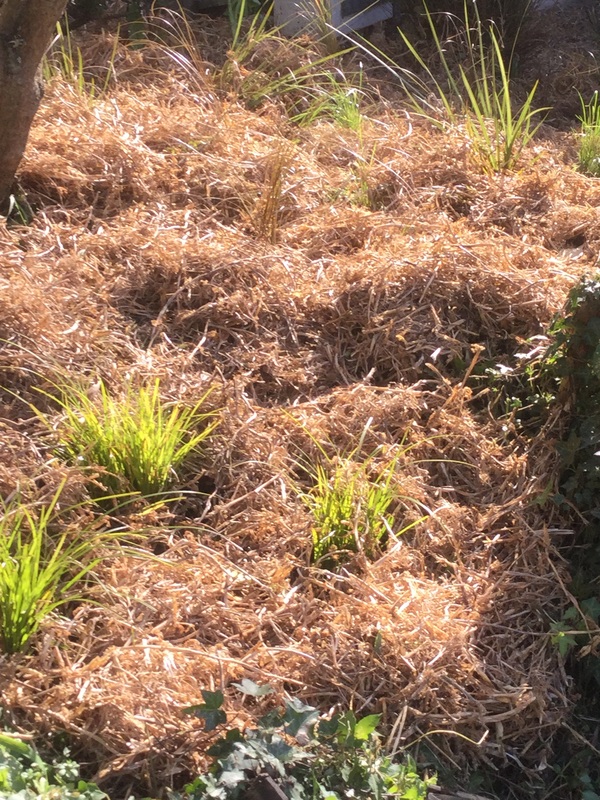 Here are the grasses in closeup, in their cosy pea-straw mulch. 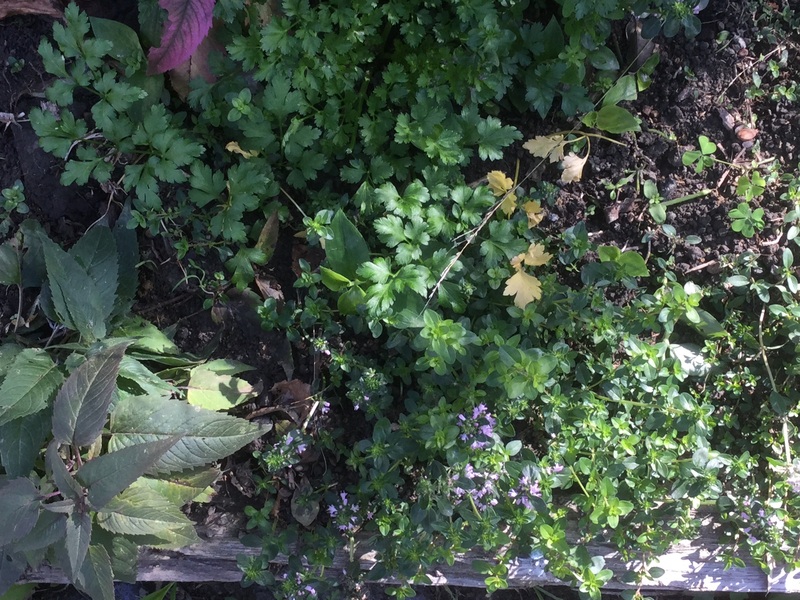 Below the first hugelkultur, parsley, thyme, bergamot, galangal and nasturtiums flourish. O yay to all of this. 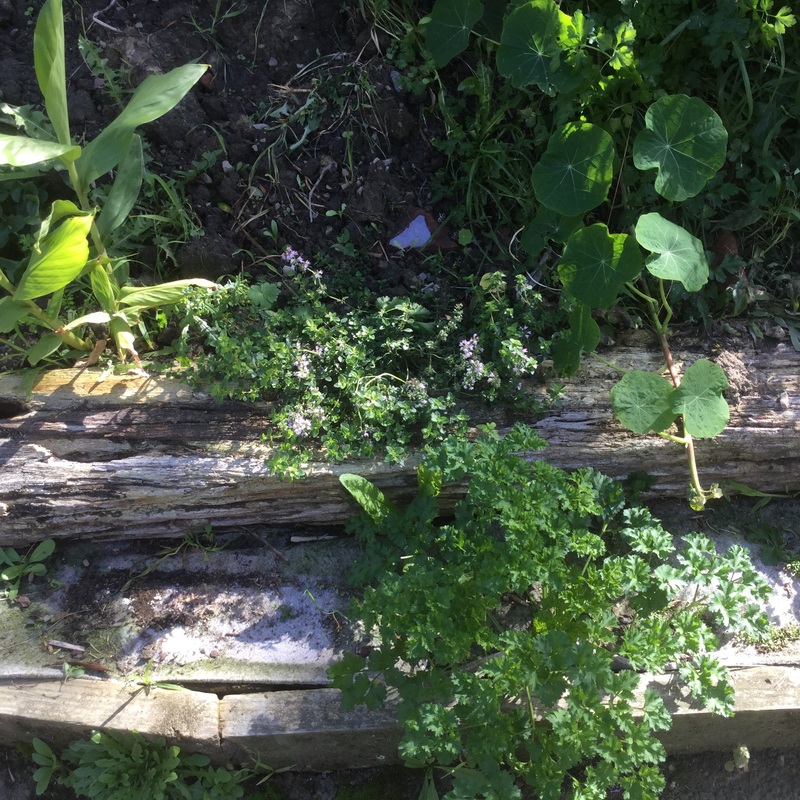 I’m very happy that our garden, the neighbour’s garden and other bits of the zigzag are all safer than they were, more welcoming for bees. And for other insects, some of them also pollinators. I know now that research shows that even organic honey contains glyphosate and that bees are attracted to flowers that contain neonics (obvious really, humans too are attracted to substances that affect their neurons). 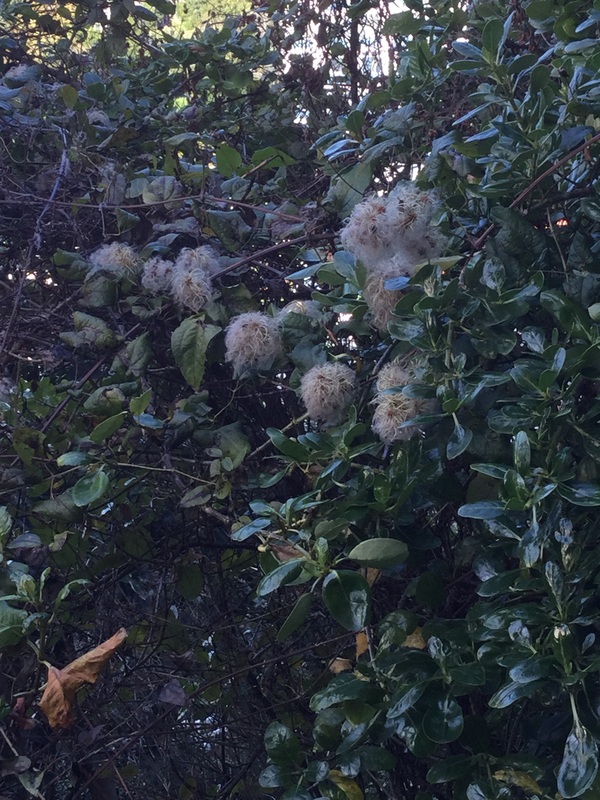 And when I see no bees around, I think ‘Did Wellington City Council’s glyphosate spray affect them?’. One still and sunny bee-filled morning, not long ago, the council used the spray on patches of old man’s beard, within 100 metres of where these photos were taken. How many bees were harmed, as they flew past on the way to our flowers? This is what the dying old man’s beard looks like. It could have been removed by hand. It’s tough going but I’ve done it. 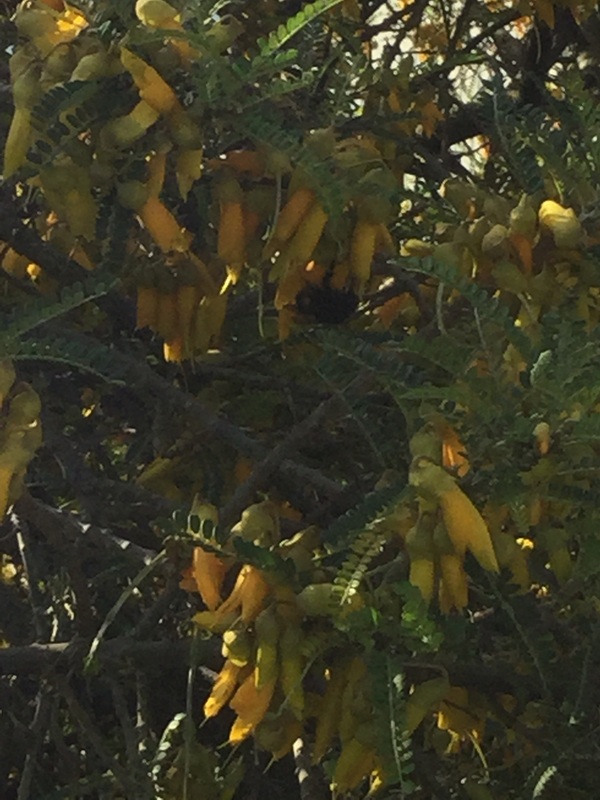 And yesterday, on the far side of some dying old man’s beard, I saw lots of bees on winter kowhai. And I wondered, was that kowhai bought from a plant shop that sells neonic-treated trees? Do the bees prefer these blooms to ours because they provide a neonic buzz? That’s when I began to feel sad. Providing a sanctuary for bees is complicated.